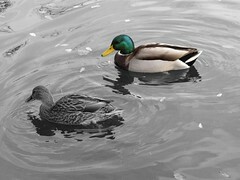 We saw these ducks in a park in Vienna last November. The funniest thing is that there were two duck couples, quacking and swimming around in circles. It looked like the ducks were entreating the mallards to pull over and ask for directions. "Fred, I don't think this is the right pond." The mallards were holding their ground, sounding appropriately annoyed to be second guessed. "It's this way, Ethel, I'm sure. Stop back-seat paddling, would ya?" "Quack quack quack quack new handbag quack quack so excited for the shopping quack"
Unfortunately I have no video evidence.